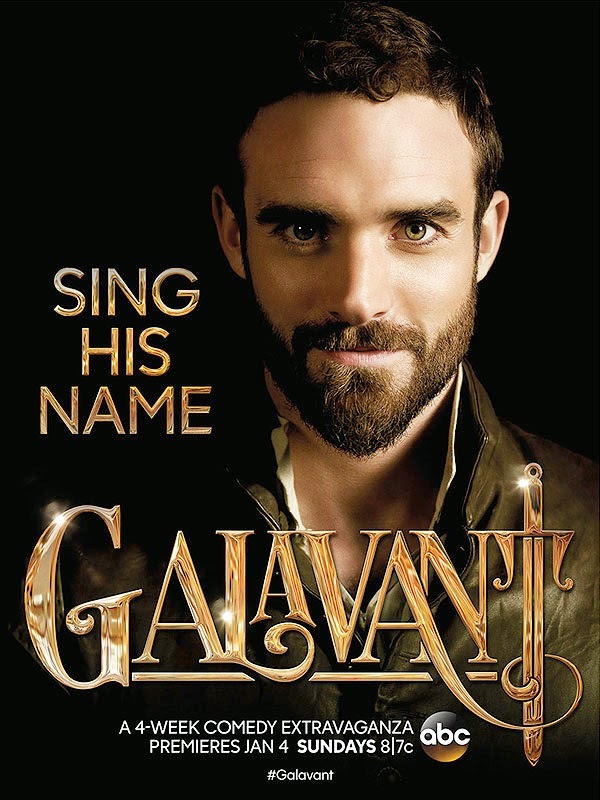 Galavant, the musical, comedy, fantasy TV series ended it's first season (already!) on TV last Sunday. It ran two half hour episodes a week, for four weeks and was a fun, quirky and entertaining romp. I was excited for this show because of the fantastic combination of genres, and because it's such a unique kind of show for TV. I really wanted it to do well, and I hope it comes back for season 2, but it wasn't a perfect show. Even though the show boasts amazing music and lyrics talents in Alan Menken and Glenn Slater (they worked on The Little Mermaid, Sister Act and Tangled together! ), I thought most of the songs were pretty forgettable from the show. The music was catchy for the most part, and the lyrics advanced the story, but I was hoping for some songs to stick in my mind more. It must be hard though to compose two or three new songs for every episode - so I'm really in awe of what they accomplished here. The show started off a bit rough I think, establishing characters - the villains and the heroes who all are not entirely true to archetype. Galavant loses his way somewhat in the hero game, and the villain King Richard (played by Psych's Timothy Omundson!) is quirky, weak and with an awful sense of humor. And he just want's to be liked. Madalena is probably my favorite character from the show - in the first episode it seems like she will be the heroine and the damsel in distress, but she turns into this delightfully selfish, lustful, and devious woman. The characters make up the main appeal of the show when they are all established. The strong cast is the main reason why I tuned in every week. The humor of the show was another great aspect. It could be sarcastic, vulgar, self-referential and entirely inappropriate for the time and I loved it! There were a few episodes that felt like they fit common comedy archetypes, but the way the characters commented on the action made it unique and hilarious. If you haven't seen this show, but you like musicals and comedies like The Princess Bride and Black Adder, then I think you will really enjoy this show. Hopefully it will be given a chance to grow - especially since the season finale left the door wide open for more plot development. Where to go from there? From bad to worse apparently, for Alexia accidentally kills the vampire--and then the appalling Lord Maccon (loud, messy, gorgeous, and werewolf) is sent by Queen Victoria to investigate. Alexia Tarabotti is a delightful character! She's outspoken, loves good food, and is intelligent and sarcastic. I loved reading all about her adventures in this novel. And of her antagonistic relationship with Lord Maccon, who finds her very exasperating. But of course there is something more between them. The romance aspect was delicious - a bit steamy, but also fun because of how unused to romance Alexia was. Lord Maccon was not a character that leaped off the page as distinctly as Alexia for me, but he was a character that I can easily think of as 'yummy' and 'book boyfriend material'. I'm sure though that there will be a lot more development to his character through the course of the series. The steampunk-ish, supernatural world the author sets up is fantastic as well - so detailed and believable, down to the pseudo-scientific explanations for the supernaturals and preternaturals. The Victorian aspect was very well described as well with the details of dress and etiquette, which made the whole world really come to life. The mystery aspect of the story sometimes felt subordinate to the romance and the development of the characters, but there were some great twists and surprises, and a highly satisfactory resolution. I felt the villains' motivation behind the mystery was relatable and something important to examine, because it is an aspect of human nature that seems to be unfortunately prevalent today and I thought it interesting to consider that universality of it while Alexia had to deal with it in the novel. But I don't want to reveal too much about that part of the story, as it might give away some key details about the mystery. The only aspect of this novel that disappointed me somewhat, was some of the illogical actions of a character towards the end. I didn't understand why that person did a couple of things, regardless of his feelings, so it sometimes felt like the situation that came of it was very contrived. But this is a great start to a series, and I plan to continue reading! And I learned a new word - bluestocking. I've heard of it before but I never really knew what it meant, but it means a "literary and intellectual woman." I love it! Well I'm sure they have their flaws in the story - they can be growly, over-protective or moody. Or maybe they have adorable quirks that annoy the heroine. Whatever right? Because they are also always focused on the heroine and will do anything to make sure she is safe and/or feels supported. So I'm good with that and ready to forgive any unimportant faults! A farmer's young wife tries to get her husband to give her a little extra money to buy a coat, but he thinks it's completely unnecessary. Meanwhile, a murderer has escaped from the asylum and is on the run. The police warn all the people in the area, so the farmer and his wife are wary when someone knocks on the door claiming his car broke down a ways back. 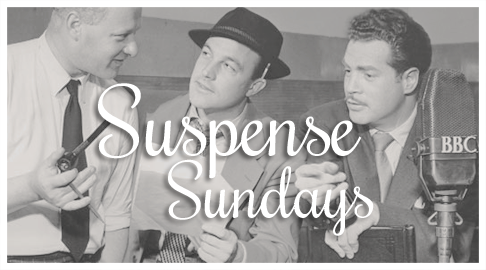 A crazed killer on the loose - such a common trope - but I'm happy to say that this Suspense episode managed to turn that on it's head for a pretty unexpected twist. It's something that kind of creeps up on you, since you're distracted by the whole murderer on the loose thing, but I think the beginning scene between the farmer and the wife is great for establishing character, as well as setting up the way this story progresses. Persuasion has the most streamlined plot of all of Jane Austen's novels I think. Most of the focus is on Anne and her feelings, although there are plenty of relatives with their quirks of character which is common to all of Austen's works. I've heard so many good things about this book that I really expected something much different from her earlier works, but there is still that ironic detachment from the characters, and the humor in her portrayals of their follies that make her books so entertaining. The one aspect that seemed different though is in Austen's more emotional depiction of love. It's not overly sentimental but there are scenes that vaguely tug on the heart strings. Of course I know how it all ended, so the suspense over how Captain Wentworth felt was not there to really involve me in their story, but I did find the ending highly satisfying, which is not something I have said about most of Austen's books. While I missed the sharper wit of Elizabeth Bennet for instance, I did enjoy that Anne was a sensible and good person that the reader could root for. And as she came to terms with her choices in the past and learned from them, it was easy to feel sympathetic towards her which made me very fond of this story, even if I was not as emotionally invested in the whole. It is really the ending that makes up for the slow development of the hesitant re-connection between Anne and Captain Wentworth. I felt the story could have been much more effective had it been shorter. 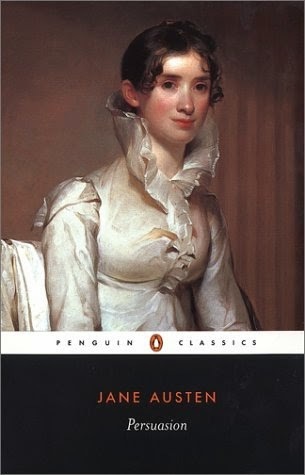 Persuasion is a worthy read though, and more enjoyable on many levels than some of Austen's other works, especially if you like sympathetic characters and a more romantic than usual (for Austen) ending. It's a delicate story, with finely drawn characters and a delightful resolution. Having finally finished reading all of Austen's novels, I would like to say that I think Pride and Prejudice would be my favorite of her works (although it's been a long time since I read it!) and my least favorite would be... Emma. I love musicals but I know there are a few musicals that I have not seen that I really should get around to watching because they are important or seen as iconic examples of the genre. So for 2015, I've decided to make it a challenge on my blog to keep myself on track. For a list to watch, I settled on the American Film Institute's top 25 Greatest Musicals, which as it turns out I've seen quite a few on the list already. But for completion's sake, I will watch all the films this year and share my thoughts on it on my blog. Watch 25 films this year - at least two a month. Review and share my thoughts on the film. Highlight my favorite sequence or song. Wrap-up post in December where I will re-order the top 25 into my own top 25 favorites. I've seen 13 out of the 25 films (the checkmarked ones), and some of them, like "West Side Story" and "Grease", I've watched bits and pieces but never the whole film. It will be interesting to watch all of these films in the context that they are thought of as the best, and see how they all compare to each other. And what they reveal about the genre. I have found that most of these films are not on Netflix streaming for some sad reason, so the library will be my friend! May 15, 2015 - Note about Movie Musical Challenge: There are quite a few films that I feel could have been in the top 25 list, so by the end of this year, I would love it if all the participants could mention what films they would have liked to see in AFI's list. It could be in the end-of-year wrap up post, or in the comments. And there is no rush, let me know any time! With those ideas, I can compile a new list of musicals to watch for 2016! If I don't include any potential films, it will just be to keep the list at 25 or under. Right now, I'm sure "The Music Man" (per Quinn's input!) will be added, as well as a personal favorite Gene Kelly film - Anchors Aweigh! If you need ideas, you can check out AFI's ballot which has a list of 180 musical movies. Thank you, and I hope everyone will still like to participate in the challenge next year! This series is shaping up to be a wonderful, evocative and emotional fantasy and I hope that if you haven't read the first book yet, you will give it a try! A French man charters a boat on the Mediterranean for him and his 'wife' to take them far away. The Captain of the boat is a bit suspicious of this man, and becomes even more so when he witnesses the man attempt to push the woman overboard. The woman tells the Captain that she is not married to the French man and was told he was taking her to see her fiancee. The Captain doesn't want to get involved in whatever business is going down though. The story moves in a predictable way, once you understand why the French man is trying to kill the fiancee which is explained a little more than halfway through the episode. This isn't a startling story in any way, but pleasant with it's noir-esque style and the Captain decided to save the 'damsel in distress.' Unfortunately there isn't a major twist in the end which would have made this episode more worthwhile. 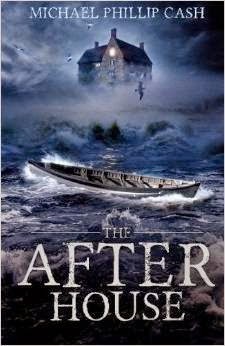 Award winning author Michael Phillip Cash adds The After House to his growing list of titles. Within two years, this prolific writer has published eight novels and four screenplays. When not writing, he loves being with his wife and two children exploring the small villages along the North Shore of Long Island. With that cover and the tantalizing summary, I had high hopes for this book. Even after I realized it wasn't supposed to be a scary story, I was prepared for a good romance/suspense read. But for me this book was just completely bland. A nice story, with nice characters that don't really jump off the page. The writing was bland as well, with many parts just a string of descriptive backstory for the characters. This is a short read, which is a point in this book's favor, but there really isn't much in plot development. There's a danger to Remy that seems to come from nowhere, and a mystery about the ghost that really isn't much of a mystery. I was just disappointed by most of this story. I also felt the lack of a believable reason for why the ghost can do so many things in the story. The plot really trades on the abilities that ghosts are said to have and does not expound on it. The same goes for the romance which is insta-love explained as the meeting of 'kindreds'. This is a book that I felt could have been so much more, but was sadly lacking in many aspects. I did feel like there was some similarity with the old film 'The Ghost and Mrs. Muir' which didn't really compare very well since I think that is a terrific movie. I received this book from the publisher or author for a fair and honest review. I was not compensated for this review. It's season four time and Deep Space Nine is really growing on me! Although I did have a hard time picking a fifth episode to add to my list - I only had four noted by the end. But really everything I've seen from this series so far pales in comparison to my number one favorite episode from this season. But more on that later! I was glad to see Worf joining the crew - his dynamic so far with the group is pretty fun! And I haven't mentioned this in my previous DS9 posts, but I have such a fondness for the character of Garak. I really love how ambiguous he is and how he never gives a straight answer about anything. His character is a delight to me. There was an episode early on (The Wire) that really delved into his character, but I actually didn't like delving into his mystique too much, so I didn't enjoy that episode as much as I would have thought. I also found out that the actor - Andrew Robinson - works as a professor of the acting school at the university I work at, so.... I am kinda hoping that one day I will see him! At least I do keep on the lookout for any public lectures he gives because I will so be there! Quark, Nog and Rom crash land on Earth, to find that they also traveled back in time to the 1940s. So it turns out I can like a Ferengi episode! But this just barely ranks in my list honestly. I think the premise of this episode is more fun than the actual episode at times, but it was interesting to see DS9 deal with the alien mythos that we currently have. 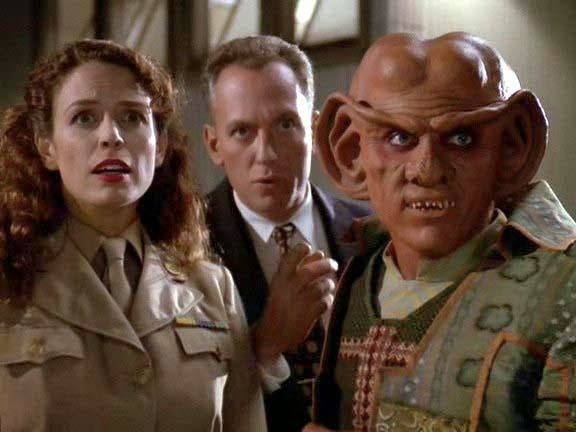 We get to understand more about why everyone can understand each other in the future and there was a lot of humor in the military meeting Ferengi for the first time. The Vulcans are definitely much better first contact species. And I was truly delighted when we discovered that Odo had hitched a ride with Quark and his family! I have a new blog layout! Responsive Design: Obviously for Blogger there's a choice between the ugly default mobile view and a scaled down version of your full desktop layout, but I've seen great mobile versions of other blogs that adjusted to the visitor's screen and I wanted to have that for mine. According to my stats maybe 5% of the people who visit my blog view it in mobile, but still I wanted everything to look uniform and pretty. So when I came across a template with a responsive design built in, I was so happy! White space: In web design, I really like a minimal look with accenting colors and lots of white space. My tumblr reflects that, as does my twitter, so I decided to bring that to my blog and let that white space open everything up. I think it also helps for when I post something with a lot of photos - the photos aren't overshadowed by the things around it in the layout and there's less of a clash of images. It makes me feel better somehow to visit my blog and see everything looking a bit cleaner and brighter. Some of the other things I was excited about adding to my site though is a Scroll to Top button in the bottom corner, a drop down menu in the navigation bar and customized post share buttons (goodbye ugly Blogger style!). So this layout took me much longer than expected - almost a week of pretty obsessive layout re-working. I want to mention a couple of resources that really helped me figure out all the kinks in my blog too - StackOverflow and xomisse. I hope this will be a design that will last me a very long time, as I don't want to keep changing the look of my blog. It's nice when a blog has a consistent, recognizable look to it. But in this case, I really wanted a little more function with the beautiful form. And hopefully this design will suit me for a long time. At least, if I do feel the need for a change sometime way in the future, perhaps redesigning my blog logo in the sidebar will be enough to refresh the look! Which do you prefer more - Read more/Post Summaries or Full Posts on blog homepages? And, how often do you click on social media links? Because I was thinking of putting my links in my navigation bar as text in a dropdown menu, but I was worried that people won't find it as easily or just assume I don't have any if they didn't see the images. During a war in Korea, a soldier happens across another injured soldier and attempts to try and get him to where he's going but unfortunately the man doesn't make it. The soldier carries out his mission though in bringing a bag to an orphanage. This is a Christmas related story obviously, so while the war-time setting seemed a bit sad, there's an uplifting twist in the end, that really made this a sweet story. It's not my favorite of the Christmas tales I've heard Suspense do so far, but the ending really makes up for the slow beginning of the episode. The Thorn of Camorr is said to be an unbeatable swordsman, a master thief, a ghost that walks through walls. Half the city believes him to be a legendary champion of the poor. The other half believe him to be a foolish myth. Nobody has it quite right. Slightly built, unlucky in love, and barely competent with a sword, Locke Lamora is, much to his annoyance, the fabled Thorn. He certainly didn't invite the rumors that swirl around his exploits, which are actually confidence games of the most intricate sort. And while Locke does indeed steal from the rich (who else, pray tell, would be worth stealing from? ), the poor never see a penny of it. All of Locke's gains are strictly for himself and his tight-knit band of thieves, the Gentlemen Bastards. Before I start on my proper review of this book, I want to talk about the reason why I picked this up. I've come to realize that I love characters who play by their wits, and almost always get away with something audacious. They are extremely clever, sarcastic and often motivated by honorable intentions. These are characters like Gen from the Queen's Thief series, Falcio from Traitor's Blade and The Scarlet Pimpernel. 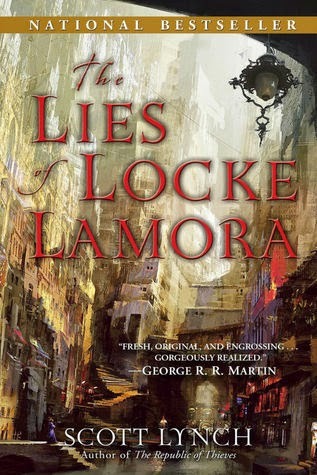 I had heard Locke Lamora might be like this, but that really wasn't the case and I was disappointed by that. Unfortunately I felt like that colored my feelings about this book, but I did try to keep my review as unbiased by that aspect as possible. I'm writing this just after I finished watching the second episode of Season 4 so I'm a bit of an emotional wreck after "The Visitor." My goodness what a perfect episode. But more on that next time. Season 3 for me, didn't feel as engaging as the second season, so I'm only going to write about three episodes. I think there were some other good episodes, but somehow I didn't love enough episodes to feel the need to talk about it. I did get stuck on "Family Business" (meaning I started it and I was not motivated to finish it for a couple of weeks) so I kind of forgot about some of the good episodes. Ferengi episodes *shakes head* Not even Andrea Martin could save that one for me. Probably 'Through the Looking Glass' should be on here because the concept is so cool, and it is fun to see alternate versions of the characters, but it didn't feel very fresh to me. On a mission, Kira gets trapped in some mysterious kind of rock that gradually grows and covers her body and Odo tries everything he can to get her out. It is entirely possible that this episode is on my list because I have major feels for Odo's unrequited love for Major Kira. I did not expect this character development for Odo, but I'm more than happy with it, because although it seems like an incongruous pairing at first but with what they've shown from their past and their interactions now, it's such a sweet romance. It seemed like they weren't going to draw out the will they/won't they tension with this episode but that was quickly reversed, so I'm glad to wait and see how it will work out. I've talked about this extraordinary musical before and was absolutely thrilled to know they were making a movie of it when it was announced. And finally I got to see it last week, after devouring the soundtrack for a couple weeks. And I have to say that... maybe my anticipation did not work in my favor this time. I did think it was a good adaptation. But just not amazing like I had hoped it would be. And it's difficult to pinpoint why that is. Although I'll try! 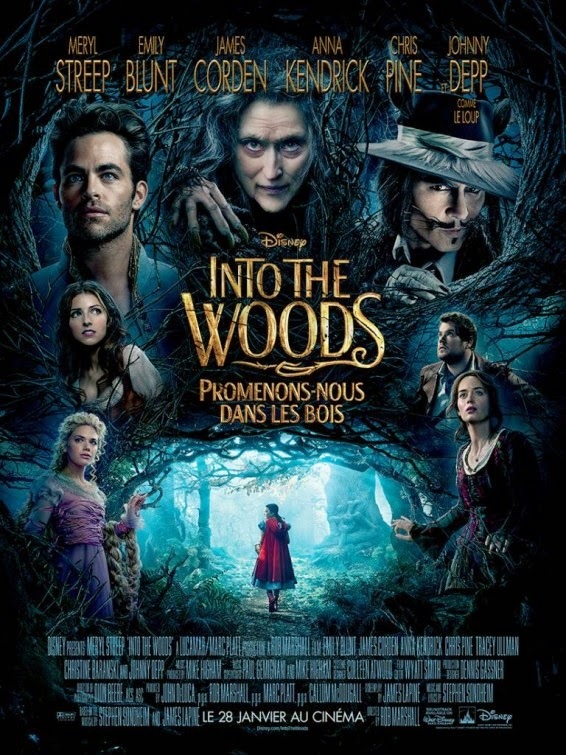 Individually, I thought the cast was superb - I even liked Johnny Depp, although I do have some qualms about how they presented the wolf portion of the story. For a film that's going for a very realistic visual take on these fairy tales, I felt like the Wolf needed to look more like a wolf and not like a cartoon. But in one area I thought Depp excelled - and that was in the way he played the Hello Little Girl scene which is very comical in the film. Okay, first I should say, that I think it is more effective as a sinister, creepy and darkly humorous scene, but given that this is Disney, I understand the change. And I felt that Depp played it just shy of too broad which felt right. And the reason I make such a point of that, is because I can compare it to the song that is my favorite from the soundtrack - Agony. Which is another comical song, but I felt it was played too over the top. It was a highly enjoyable scene, but it felt jarring from the tone of the film and took away from the believability of the Princes. Juan Nunez takes a climbing trip on an Ecuadorian mountain and literally falls into a secluded valley - a lost place known according to legend as the Country of the Blind. The group of people who live there were cut off from the rest of the country and through a rare disease all became blind. Their offspring were all born blind as well. And "in the country of the blind, the one-eyed man is king." But not in this story. This is based on an H.G. Wells story which was highly praised in the beginning of this episode. The story itself is a sadly ironic one, with a twist that I predicted, but just from this radio adaptation it is hard to figure out the message of the story. I thought the story was told well and it has an intriguing premise, but I didn't really connect with the story or feel very invested in the outcome. It was funny how badly Juan tries to explain what sight is to these people who have absolutely no reference. There's something wrong with Rosewood Manor. As the feeling of being watched grows, she begins to realize there is something else in the house with them--some creature that stalks the frozen halls and claws at her door. A creature that seems intent on harming her. When a fire leaves Anne trapped in the manor with its Master, she finally demands to know why. But as she forces the truth about what haunts the grounds from Lord Grey, she learns secrets she isn't prepared for. The creature is very real, and she's the only one who can help him stop it. Now, Anne must either risk her life for the young man she's grown to admire, or abandon her post while she still can. 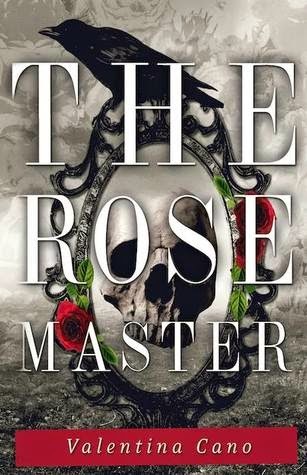 This was a very enjoyable dark, suspenseful, Gothic tale with a very sweet romance. But it did have some flaws for me that really hurt my overall feelings for the story. Even though the romance was very sweet and served the story well - I wish it had been fleshed out more, and there was such a predictable trajectory to it that made it bland. And although the story had a Victorian feel, the dialogue and the way the characters acted sometimes didn't feel completely true to the time period. It took me out of the story sometimes, so that the story was not as immersive as I would have liked.